i can't wait to hear abt prado's price. does any know abt it? I had a chance to check out the new offerings from toyota today and i was shocked! The 1.5L terios manual comes fully loaded with EVERYTHING including 4x4 for 2499000 whereas the auto 1.5L comes with NOTHING (not even 4x4) for 2399000. The new prado comes in diesel and petrol and the prices are equally insane. toyota has also launched the fortuner (a SUV version of the Vigo) for 7299000!!! Then there is the Avanza (looks like a people carrier) which starts at 1799000 for the 1.5L petrol manual and ends at 1999000 for the 1.5L petrol manual (up spec) and no diesel option. land cruiser prices have reached a dizzying 16000000 for the 4500cc petrol or the 4200cc diesel. clearly people in this country are mad to ask/pay these prices. as i only saw a auto trany version and yes it wasnt luking gud at all. Suzuki Vitara luks better. God noes its price. your price on the manual is right but the auto is cheaper, even the sales woman at toyota was laughing at how the auto is cheaper but it makes sense since the auto will be in basic spec and the manual will be fully loaded. I actually have an original toyota price list lying on my desk which will become available today or tomorrow from the dealers. do note that the terios is in the same class as the jimny, not the vitara. The vitara competes with the base fortuner and rav4. yup ure right auto is 1 lack less i confirmed it. This is madness pure madness now even the used 200 series' price will increase ... Any idea how much does a vogue cost these days? As a general rule, those models, which have been formally homologated for a specific market cost more than those that are grey imports.. So, under the current price regime, a brand new Vogue might as well cost less (or maybe about the same) when imported than a brand new LC 200 imported by indus motors officially..
For instance, a prado or LC that has been imported through indus motors would invariably cost more than its corresponding JDM/UKDM of the same year, despite the fact that indus models tend to be quite low on specs...thats because they come with a proper warranty..
^ probably dats some toyota guy. khare khare zang lag raha hoga, lol, but still choice ke bat hai, coz the better option then a camry is the c class thats too small. E class is expensive and the new model i guess hasnt been launched officialy in Pakistan or mayb it is. as i spoted 1 in karachi. i wud still prefer a old C rather then a CL9 but u noe as people, "oye Mercedes barri party hogy" so people avoid mercedeses in that manner also. They are also launching Fortuner and avanza. Saw it on roads of lahore. its everywhere. 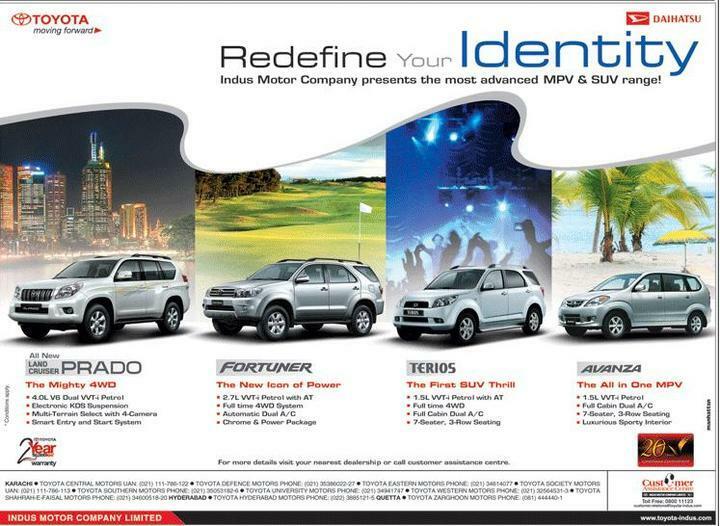 Toyota Indus have finally launch these SUVs and MPV. Here is the ad from today's Jang. No mention of price. * EX Factory ; Subject to change without notice. Inclusive of all Taxes. i was planning on replacing my highlander with a fortuner but at 72lacks,... i don't think so! it's a freaking VIGO hatchback,... why 72 lacks??? ?